The US Coast Guard saw a flood of Cuban immigrants attempting to make the 90-mile trip to the shores of the United States during December, stopping 481 migrants in 37 different events ‒ a 117 percent increase from December 2013. In just the first five days of 2015, a total of 96 Cuban migrants have been interdicted at sea in seven separate events in the Florida Straits, the US Coast Guard (USCG) announced. The Department of Homeland Security’s maritime agency repatriated 121 Cuban migrants to their home country on Monday. “All seven interdictions included unseaworthy, homemade vessels that posed significant risk to the migrants attempting to make the perilous journey,” the USCG said in a statement. The Coast Guard has increased patrols of US waters around Florida ‒ known as the Florida Straits ‒ since President Barack Obama announced in mid-December that the US is seeking to establish diplomatic relations with Cuba and soon plans to open an embassy in Havana, authorize sales and exports between the nations, and make changes to current travel laws that for decades have restricted traffic between the two countries. 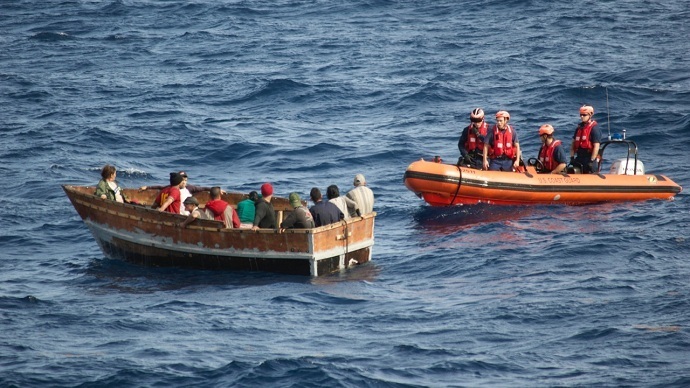 "The Administration’s recent announcement regarding Cuba does not affect immigration policies including wet foot/dry foot or the Cuban Adjustment Act – which only Congress can change," said Rear Adm. Jake Korn, Coast Guard 7th District commander, addressing rumors that the US would abruptly end its current Cuban immigration policy as early as next Thursday. "The Coast Guard strongly discourages attempts to illegally enter the country by taking to the sea. These trips are extremely dangerous," Capt. Mark Fedor, Coast Guard 7th District chief of response, said in the statement. "Our main goal is to support national policy of orderly, safe and legal migration through deterrence of unlawful maritime migration, including migrant smuggling." During the so-called Mariel Boatlift, 27 migrants died, including 14 on an overloaded boat that capsized on May 17. A similar exodus occurred during the summer of 1994. Cubans know the risks of the shark-infested, choppy waters between the two countries. "I'm crazy to leave, but I'm not going to throw myself into the sea, I'm not going to do it," Juan Moreno told the Associated Press in Havana. "He who does that is crazy." Yet illegal immigration from the Caribbean – including from Cuba – frequently spikes based on rumors, Marine Gen. John Kelly, the chief of US Southern Command, told Washington Post’s Checkpoint blog in an interview before the Obama announcement. The US president hopes that normalizing relations between the US and Cuba after 50 years will guide the communist dictatorship towards reforms and openness. He is looking to Mexican President Enrique Peña Nieto to join him in pressuring Cuba to make democratic reforms, the Associated Press reported. But Cuban President Raul Castro has adamantly said that democratization will not happen. Obama and Peña Nieto met at the White House Tuesday to discuss Cuba and the newly updated US immigration policies, which the US president enacted via executive action in November. The Mexican leader has praised both of Obama’s unilateral actions in recent weeks.